The Hogfors Fig 311 High performance butterfly valve is manufactured with a carbon steel body and stainless steel double offset disc and stem. The body is wafer pattern so it can be fitted to a wide range of flanges, the option of metal or PTFE seat ensures the valve is suitable for a wide range of applications. 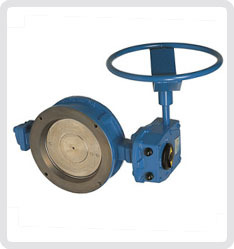 It is the economical solution for applications outside the scope of rubber lined butterfly valves that do not justify the expense of ball valves, a range of manual, pneumatic and electric actuators is available. Size range 80 – 600mm. This Valve is also available in a Firesafe / Steam duty version Fig 31101CS .